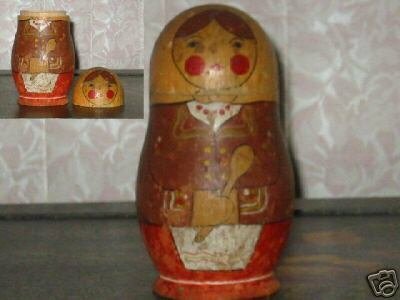 Very old Polish nesting doll that opens at the neck, was originally purchased from an antique mall. This doll is very unique in the way it opens - at the neck and not at the waist or at the bottom like most nesting dolls. One other very unusual characteristic she has is the wood is VERY thick (about 3/8") so she is quite heavy. She is wearing a yellow babushka over her brunette hair, a brown jacket with yellow buttons and a multicolored design to accentuate her sleeves and collar. Underneath her jacket she is wearing a white blouse, and on her neck she has red dot beads that match her red skirt. She is also wearing a white apron on top of it and holding a brown wooden spoon with her right hand. Because she is old she has age stains, paint fading and paint loss. She also has age cracks on the back that do not go through and do not affect the integrity of the piece. She measures 4 3/4" tall.